The Commons will vote on proposed changes to the Data Protection Bill on Wednesday, which would impose financial penalties and another inquiry on the media. Bosses of regional and local titles have condemned the “draconian measures” that will cause “irreparable damage to the sector if enacted”. Tom Watson, Labour’s deputy leader, wants to introduce sanctions on newspapers for data protection disputes, forcing them to pay court costs even if the complaint is thrown out. Ed Miliband, the former Labour leader, is using a separate amendment to the bill to demand a fresh investigation into the media. John McLellan, director of the Scottish Newspaper Society, said: “The system of self-regulation introduced and funded by the industry follows the Leveson recommendations with the exception of giving politicians control. “What kind of free press cedes control to the very people it is supposed to hold to account? “Yet these amendments are designed to give politicians with an agenda the ability to shackle publications they don’t like and as such would be little short of an attack on the right of UK citizens to know the truth. Mr Watson has revived the section 40 costs clause, which was dumped by the Conservative Government in relation to libel cases when it decided against proceeding with the second part of the Leveson inquiry. 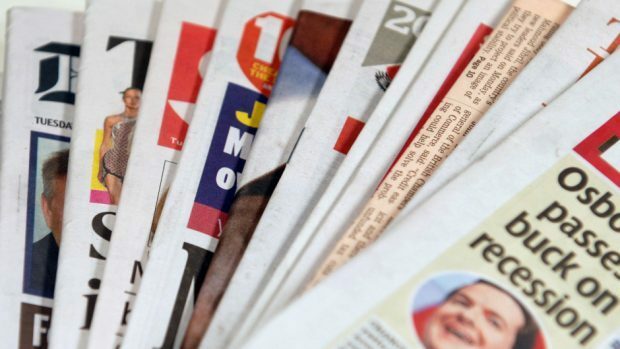 Jeremy Corbyn’s deputy said that newspapers can avoid the paying costs on a win-or-lose basis if they sign up to Impress or seek state accreditation through another regulator under the Royal Charter. He told the Commons that the “press has no predators” and that the amendments would “redress that imbalance”. Local newspaper chiefs have queued up to urge MPs to defeat the amendments. Richard Neville, Editor-in-Chief of DC Thomson morning newspapers, said: “There is a worrying trend among some politicians who seem hell bent on making it as hard as possible for newspapers to hold those in power to account. Former Labour leader Ed Miliband has put forward an amendment to the bill to set up a huge new statutory inquiry into the media. Critics say that will be a massive burden on the taxpayer and will inevitably lead to more measures that are damaging to free speech. There is also the threat of financial penalties for those who did not sign up to a state-approved press regulator. The only accredited body is Impress, which is backed by the former F1 boss Max Mosley. Most publications have signed up to Independent Press Standards Organisation, the independent regulator funded by media organisations. Under Labour deputy leader Tom Watson’s amendment, those who do not sign up through the Royal Charter system are liable for the complainant’s court costs in a data protection action, regardless of who wins the case. While there are exemptions for Scottish newspapers, 85% of local titles north of the border would still be affected. Some MPs also want to end journalists’ exemption from data protection rules, which are necessary for protecting the anonymity of sources. The UK Government is opposed to the changes, but without the support from another party can be defeated on the amendments. About 65% of local editors said it had become harder to access and publish information in the public interest since the publication of the Leveson Report in November 2012, according to a survey by News Media Association.